When a star employee announces he or she is thinking of retirement, it’s bound to make an employer wince—no savvy company wants to lose all of the knowledge and experience that individual brings to the table. And while many employees approaching retirement age may wish to explore other avenues of life, the thought of severing their connection to the professional world can be downright terrifying. For those looking for options, there is semi-retirement, but the question is, can your firm accommodate such an arrangement? It depends on how you define semiretirement (or, in HR lingo, “phased retirement”). Nancy Collamer, a speaker and career coach based in Old Greenwich, CT, and author of Second-Act Careers: 50+ Ways to Profit from Your Passions During Semi-Retirement, points out that phased retirement can be modeled in a number of ways: the employee may work a set number of hours a week on a part-time basis; they may only work during peak times of the year; or they may serve as a consultant for special projects. 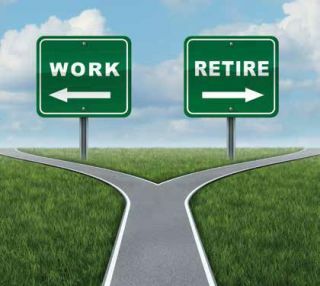 Phased retirement may also be truly phased—the employee plans to fully retire in a fixed period of time, gradually decreasing their workload as their retirement date approaches. Not only does the company have to examine whether it’s structured in such a way to render any of these scenarios feasible, Collamer notes that both employer and employee must determine how this new arrangement will affect the person’s benefits, since a reduction in hours could have an impact on things like their eligibility for health insurance, profit-sharing, and their company pension plan. Foreman advises companies to figure out just what they would be losing out on if that individual were to leave for good. “Is it their Rolodex? Is it their knowledge of historic products? Is it their skills and expertise in some form of engineering? What is it that this person really provided that you don’t want to lose?” he said. Once that is established, then the issue becomes: can you create a position that is flexible enough to enable this person to continue to apply their skills and expertise while semi-retired? Nancy Collamer is a speaker and career coach based in Old Greenwich, CT, and author of Second-Act Careers: 50+ Ways to Profit from Your Passions During Semi-Retirement. This is where things circle back to logistics. An employee who was charged with managing legacy software code, for example, may be able to continue working on a semi-retired basis quite easily. “If that’s what this employee knows, then you don’t have to worry about them learning new things, keeping up with new technology, meeting new people, being out in the field, and going to conferences–– you just want that skill,” Foreman said. “No problem––that person can work from home on a project basis.” But what if the professional in question was one of your star sales trainers? People in sales need to remain current in their product knowledge, and to be effective, they must be developing new contacts and nurturing existing relationships constantly. If they shift into semi-retirement, how can you best put their skills to use? “Maybe they train the sales trainers,” Foreman said. It’s a little different than managing legacy software, as it requires the individual to commit to coming into the office and maybe even working in the field. What Does “Retirement” Really Mean?